This book explains the business opportunities that are available for IP television systems, which range from producing low budget specialty programs to becoming a global broadcaster. Anyone can participate and profit from the many new opportunities in the IPTV industry. IPTV offers hundreds of new types of services and delivers existing TV programs more effectively. You will discover that life will change when people have access to more than 1 million television programs. You will learn how IPTV systems work and learn that IPTV programs can be watched on different types of viewing devices such as standard televisions with adapters, dedicated IP televisions, multimedia computers, and mobile telephones. This shows the global IPTV subscriber forecast from 2007 to 2011 will grow from 14.3 million in 2007 to 63.6 million in 2011, a compound annual growth rate of 45 percent. This chart shows that Europe remains the leading region and its subscriber numbers have increased versus the October 2006 forecast. Asia’s prospects have continued to improve as tests in China and India have blossomed into successful deployments. 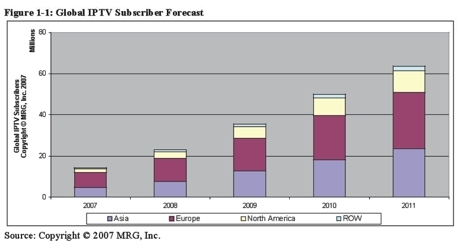 MRG forecasts that Asian and European subscriber numbers will steadily grow closer from 2007 to 2011. 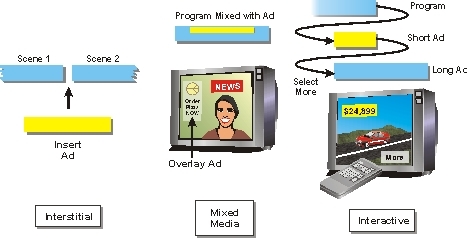 This figure shows how IPTV advertising messages can be in the form of interstitial broadcast messages, mixed media messages or interactive ads. In example A, a network operator provides a program with advertising messages already inserted (interstitial) into the program. Example B shows how an advertising message may be overlayed or merged into the underlying television program. Example C shows how an advertising message my change based on the selections of the viewer. This figure shows how a television program can use mixed media to provide product offers to qualified consumers at specific times in a display location that is noticeable but not intrusive. This picture shows that during a news program, the viewer is presented with a pizza icon from a local pizza restaurant. This example shows that when the user selects the icon, a small window appears with the pizza offer details. Learn how telephone, CATV, mobile telephone, and electric utilities can offer TV services through their existing systems. Discover how private IPTV Systems (Hotels, Hospitals, Schools) can obtain new service revenues from television systems that they own. IPTV has a Google-Like advertising model where advertising messages can be targeted to specific viewers. Because IPTV ads can be addressed to specific viewers, they can achieve 10x the amount of advertising revenue. Since IPTV systems use two-way communication, the advertising messages can be linked to television shopping carts (t-commerce. To create this book, the author Lawrence Harte (publisher of IPTV Magazine) interviewed more than 2100 executives, technologists and business leaders to discover the current and emerging opportunities. More than 20 industry research companies have provided charts and graphs to help you discover the opportunity that is best for you.